“I don’t remember anything about the accident, so I’m not scared to get back behind the wheel," said Caleb Clemon, a traumatic brain injury survivor. Just weeks after being involved in a work-related car crash on interstate 80, Caleb Clemon is back behind the wheel at Madonna’s Omaha Campus. 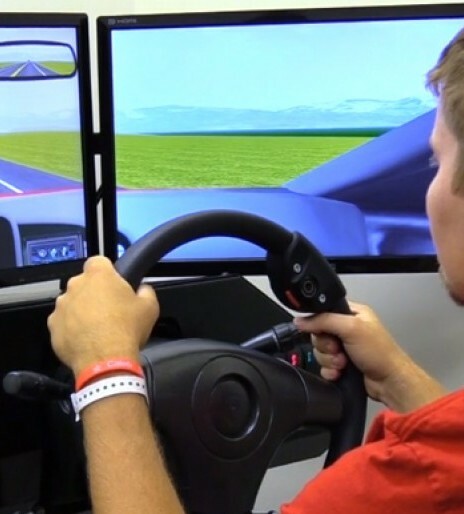 He’s using a driving simulator to test his navigational, memory and reactionary skills. “I pulled over under an overpass because it was hailing, and I was backing up to get back on the road and a semi hit me,” said Caleb. When Caleb first arrived at Madonna in late June 2018, he had extensive injuries from the crash including severe brain trauma. Caleb says despite his limits early on, he didn’t have to strike out when taking part in patient outings. Therapists were able to adapt specialized technology to accommodate his limited mobilty. “I was in pretty bad shape, I couldn’t really use my left side," said Caleb. “We were working on the Moveo, which is a leg press machine. They were able to customize it, so I could do it with just one leg since my I couldn't put any weight on my right leg," said Caleb. "I got cleared yesterday to put weight on it so we're practicing walking now and balance and stuff," said Caleb. Stuff that not only challenges him physically but also mentally. It’s all in an effort to get back to Caleb’s true passion of working with animals, namely cattle. "This one was when I showed my heifer at the Clay County Fair. It was when I was leaving the show ring when the judge was talking about my heifer," said Caleb as he scrolls through pictures on his phone. "I'm pretty good with animals preferably cattle. We also show cows, sheep and pigs," said Caleb. Caleb plans on heading back to college this fall but not before taking in some county fairs. "My goal is to be a farm manager when I graduate," said Caleb. “It’s been top of the line. the nurses are great. The experience was awesome, and Madonna is a great place to come,” said Caleb.